Taiwan's high temperature and humidity, where the annual average humidity of up to 75% RH or more, is a hotbed for rapid growth of mold. And insect specimen’s protein is most vulnerable to microbial attacks. According to research, once these damages occur, specimens cannot be restored using alcohol wipes, and in fact are irreversible. Many conservation centers, museums and other collections recommends to store specimen in 45%RH-55%RH in warmer seasons/regions. Condition 1: Equipment and supplies used for taxidermy, such as cotton, fixed wire, metal wire, borax, needles and other insects are susceptible to moisture rust, deterioration, and even qualitative damage. Condition 2: During the collection/processing of the specimen, antiseptic measures and preservation of environment must be strictly controlled. If no strict protocols are followed, when humidity reaches mold growth conditions, tiny mold spores that had long been attached to the specimens, will grow out of control! Causing substantial damage to the specimen! Condition 3: The protein samples themselves, are most vulnerable to the ubiquitous microorganisms attacks, and "humidity control" is one of the most important factors for the survival of microorganisms. By controlling the humidity, microorganisms can be significantly reduced, significantly reducing specimen erosion damage probability! Condition 4: Dust damage, pests, rodents, light pollution, etc., are generally storage problems that has no combined solutions. These may seem unimportant little details, however, it is these damage affecting specimen storage time and sample integrity. 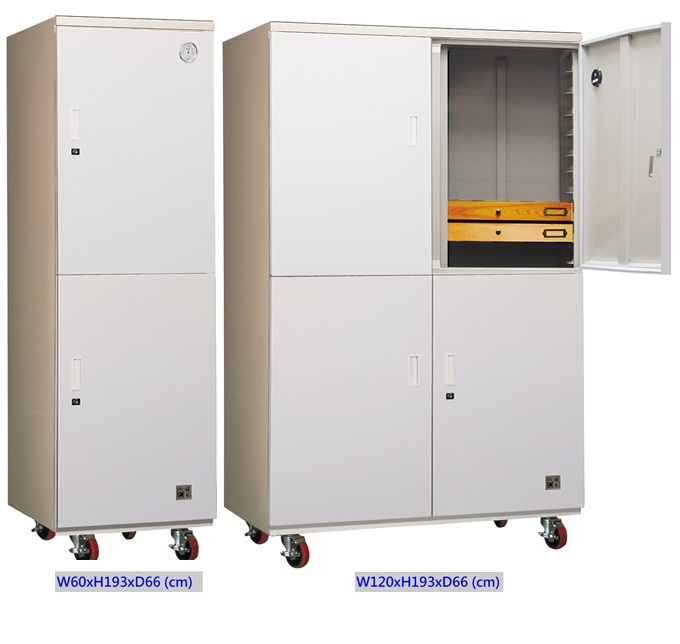 Eureka's Auto Dry Box Professional & Spacious series products will provide trusted protection from these moisture and other damages to any specimen collection. Ambient temperature dehumidification, specimens will not produce secondary qualitative damage from heat or condensation. Automatic savings once power is plugged in (less than $2 USD in electricity cost) silent operation with no complicated setup or operating problems. Automatic control of humidity range can be set specific to specimen needs for storage/preservation condition. Easily meets the optimal humidity conditions. Utilizing ambient temperature dehumidification, Eureka products provides stable and safe conditions from environmental/ambient temperature changes. Even during long-term power outages, dehumidification protection continues if cabinet remains sealed. Automatic dehumidification function can be instantly adjusted by the user according collection’s needs, no complicated setup or adjustment problems. We also offer tailored designs according to the actual needs of the customer. If you have a special storage needs such as size, function, or expensive resources such as equipment and/or material, we welcome you to with these special requests.